The black Canon VIXIA HF R500 Full HD Camcorder records Full HD 1920 x 1080p video directly to a removable SD/SDHC/SDXC memory card. It also supports 2.07MP still image capture. The HF R500 features a 3.28MP Full HD CMOS image sensor and a DIGIC DV 4 Image Processor. It employs a Canon HD video lens with 57x Advanced Zoom and SuperRange Optical Image Stabilization. For easy recording and instant playback, the camera has a 3" capacitive LCD touch panel display as well. Designed with all levels of users in mind, the HF R500 has a laundry list of features including MP4 and AVCHD independent or dual simultaneous recording, an advanced Baby Mode, Intelligent IS, Smart AUTO, a higher capacity battery for longer shooting sessions, and much more. For connectivity to your HDTV or high-resolution monitor, the HF R500 is equipped with a mini-HDMI output. For improved audio monitoring and recording, the HF R500 has a headphone output and a microphone input. The headphone jack also doubles as the analog audio/video output on the camera. If you want to give your home videos an interesting cinematic feel, you can employ one the HF R500's seven Cinema-Look filters before you start shooting. You can also add one of these filters after you've finished recording. Each filter is adjustable as well, so you can dial in the perfect cinematic look for each recording. The HF R500's other main features include Video Snapshot, Genuine Canon Face Detection, a 30p Progressive shooting mode and a 24p Cinema shooting mode. This camcorder incorporates an advanced Canon HD the DIGIC DV 4 image processor for enhanced imaging performance. The increased performance allows for better noise reduction and leads to brighter, more noise-free images - even in dark scenes. This model features a capacitive 3" touch panel LCD screen that makes recording and other operations easy. Open the panel and the power is on. A gentle touch activates the display's intuitive functions. Choose a focal point, track moving subjects, control exposure for selected areas, and operate camcorder controls from the screen - all with a touch. In addition, the easy-to-use user interface makes your shooting experience simpler. The Home button is on the menu screen, and provides quick access to all functions. Clear explanations for key settings pop up when selecting shooting modes and recording formats, so you can be confident in the decisions you make. This model is powered by a higher capacity battery pack than previous Canon camcorders. The rechargeable lithium-ion battery not only lets you shoot longer, but features intelligent technology that accurately indicates remaining battery time down to the minute. Intelligent IS makes it easy to shoot clear, sharply focused video - even in situations that typically cause camera shake. The Intelligent IS system analyzes the shooting situation for you, then automatically switches to the image stabilization method best able to produce sharp, steady video. Four IS systems cover the gamut of shooting situations. Dynamic IS corrects minor movement and the shaking caused by walking while shooting. Macro IS delivers perfectly steady close-up shots. Powered IS comes into play when you're using the camcorder's powerful zoom, correcting shake that can occur in telephoto shots. Tripod mode stops IS when the camcorder is stationary. Box Dimensions (LxWxH) 7.0 x 5.6 x 5.0"
VIXIA HF R500 Full HD Camcorder (Black) is rated 4.5 out of 5 by 132. Rated 4 out of 5 by Anonymous from Quality with a pathetic battery I wanted to rate this product much lower based solely on the battery life and ergonomics for people with large hands, but the video picture quality and ease of use for the price wouldn't let me. I have very little experience with cameras in this category; however, I was shocked with the battery life (less than two hours recording, shorter than my recording time on the SD card I purchased). I was also disappointed in the ergonomics of this camera if you have even moderately large hands; this thing is tiny. However, in moderate light levels the video quality met and exceeded my expectations at this price point and the simple controls made it easy to get the job done. Rated 5 out of 5 by Michael from Excellent Camera This is my 4th Canon camcorder. All are still in service. 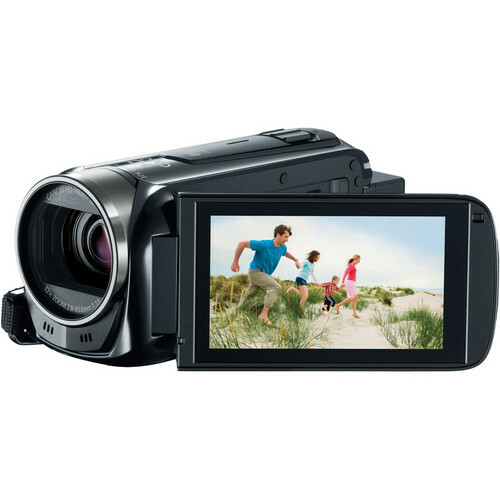 This is a very full featured consumer camcorder that delivers excellent performance. Although not quite up to the capabilities of Canon's CMOS Pro sensors, this camera delivers excellent video. In low light situations there is some diminution of the image quality, typical of consumer level camcorders. I use this camera in a professional setting as part of a multicam configuration. It is not my main camera, but among those that I use for cutaways. This camcorder is also a great value. Rated 5 out of 5 by Anonymous from Excellent camcorder used with MacBookPro I just bought this camcorder because I am tired of Sony MiniDV camcorder, with MiniDV I need a lot of cables and a lot of software in order to get the HD video. With the Canon VIXIA R500, I only need to configure MP4 video and that's all!!! iPhoto in my MacBookPro recognises the format then the import is the same as a photo, in MP4 Mac-compatible and if it necessary, Canon provides to Mac with ImageBrowserEX software in order to import the photos/video, when Sony do not provide anything and you must buy their software (like Vegas). Excellent choice with this camcorder!!! Rated 5 out of 5 by humanGAMER from Perfect camcorder for the beginner. I use this camcorder to film short videos for YouTube. The ability to record in mp4 makes it easier for when uploading to my editing software. The built in features are wonderful and you can really set it up to get that perfect look. The quality of the video is a complete delight, with many different quality settings to choose from. I have a studio lighting system I use so I cannot attest to how the picture holds up in low light settings. For those who are looking into getting into making videos and can't dish out the money for a high end DSLR, I recommend this. Rated 2 out of 5 by Rob the Amateur Videographer from Disappointing low light performance Perhaps my expectations were just too high, but I assumed a handheld camcorder in 2014 would compare reasonably well to my old HDV Canon HV-20 from 2007. Turns out that's not the case -- in a side-by-side comparison, the low light performance isn't anywhere near as good as my old camera, with blotchy noise appearing throughout the image and details being lost. Daylight performance is good however. Feature wise the camcorder is nice, with decent image stabilization and reasonable zoom. It's also light and compact, which are pluses, particularly when traveling. Low light performance is important to me as I record school plays, and I just couldn't overlook that shortcoming. If that isn't a concern or if it will only be used in well lit environments, then this camera would likely suit your needs. Rated 5 out of 5 by GalileoMedia from Tough Enough for Heavy Use in a School Our cameras get a lot of use. Our high school has a video class with 32-38 students in any given year. There school days where every camera is used at least once and weekends when all 8 cameras are checked out by students. We started with Canon ZR80s, then ZR500s, 800s, 900s, and 960s. These HF R500s are the sturdiest yet. It took more than two years before the first of these cameras started giving us problems. I've recommended Canon to other teachers starting video programs. Rated 5 out of 5 by Bill from Great little camera! This unit is lightweight and super compact. I am actually using a lowepro lens case for it when it is not in my full bag. I went with this at a much lower price rather than the R52 with 32gig on board memory. I can purchase a few cards for the price savings. I have only toyed with it a bit so far so I can't fairly review all its features yet so far I am very pleased. I did purchase the Watson AC/DC charger along with an extra lithium Ion Battery. The charger worked great and is also small and compact. Without a third party charger you must charge the battery on the camera! If I'm running sound from my stereo into the mic jack, can I manually set sound levels in the camera? The microphone input of the camera will not accept the hot line level signal from your stereo. What spare Canon batteries will work with this camera? does all acessories come with this canon camcorder if ordered in box? Can this camcorder be charged while recording (say, with outlet plug-in)? Yes. This camcorder will charge during the recording mode, while connected to wall current with the included AC power supply. Does this have an automatic post to youtube feature? Does it come with editing software? Unfortunately no. RDE's MiCon Connecto/RDE Lavalierare used with wireless systems. This mic is designed to be connected to a wireless bodypackk transmitter. it derives the required power from the bodypack. Can this video camera take still photos as well as video? Yes it does. very easy to do via the touchscreen. will cannon's wireless controller work with this camcorder? Answered by: JUAN CARLOS H.